It's the biggest trend in healthcare this century: value-based reimbursement, which bases provider reimbursements on quality and value components instead of the standard fee-for-service model. In recent years, we've seen legislation such as the Affordable Care Act (ACA) and the Medicare Access and CHIP Reauthorization Act (MACRA) include reimbursement modalities for public plans tied to quality models and the structural development of accountable care organizations (ACOs). CMS announced its own efforts as part of its "Better Care, Smarter Spending, Healthier People" campaign to tie up to 30 percent of traditional Medicare payments to ACOs, bundled payments, value-based purchasing, and hospital readmission reductions by the end of 2016. This will move up to 50 percent by 2018. Change can be scary, especially when it comes to your practices' revenue. Let's walk through these proposals to see how many of the new provisions will affect most medical practices and what you really need to know when it comes to your reimbursement. According to the American Hospital Association, there were more than 133 million emergency department visits and 38.4 million hospital admissions in 2013 – numbers that continue to rise. It should come as no surprise that many of the efforts to rein in reimbursement by imposing quality and value metrics are directed at hospitals. Three of the main modalities of CMS's plan to reward value and quality over quantity are aimed at hospitals: hospital value-based purchasing, hospital readmissions reduction programs, and bundled payments tied to hospital stays. For the average manager of a non-hospital-based practice, most of these programs and models will not affect your reimbursement directly. However, physicians can help manage the transition of patients from the inpatient to outpatient settings by working with patients to establish care goals, educating and supporting patients' self-management of their medical conditions, and supporting safe and effective medication use. Additionally, if physicians are participating in any bundled payment programs, such as those that are being piloted for total joint replacement, they may have exposure for a specific number of days postsurgery if the patient is readmitted. Typically, payment for an episode of care, such as a total joint replacement, would be reimbursed by the payor to a coordinating provider (e.g., the hospital where the surgery is performed) as a lump sum payment per case, to include a certain number of days prior to and a certain number of days after surgery. Any care related to the episode would be reimbursed out of the lump sum payment to any downstream providers on the care team. Any readmissions for infection or complication could be denied payment based on other factors if deemed preventable. CMS administrators have firmly planted their flag in the land of primary care providers. Primary care providers are viewed as the frontline coordinators of care for patients with acute episodes or chronic conditions because they are typically the first provider to render a diagnosis that is confirmed by a specialist. The specialist often takes over the primary care role for the episode of care. There are two initiatives under way at CMS that have a high likelihood of migrating to the commercial insurance arena if ongoing pilots continue to show success as early returns indicate. Both the Comprehensive Primary Care Initiative (CPC), which is a multipayor and provider partnership, and the Multi-Payer Advanced Primary Care Initiative (MAPCP) include providers delivering care management for patients at greatest risk, improving healthcare access, tracking patient experience, coordinating care with hospitals and specialists, and using health information technology to support population health. Practices receive non-visit-based care management fees from the participating payors and the opportunity to share in savings. While this is not a classic performance-based reimbursement model, the shared savings provide financial incentive. The model could be scaled for the commercial market and provide additional incentives for primary care provider groups who have the IT infrastructure. Payor reimbursement mechanisms are slow to change. However, this type of management fee would be similar to a per member, per month (PMPM) capitation, which most payors are able to accommodate. For a practice with the capacity, participation in this type of program, if available, could be a good leverage point in a payor negotiation. Created as part of MACRA, the Merit-Based Incentive Payment System (MIPS) is getting a lot of attention as one of the new models to inject quality and value into provider reimbursement. Casually referred to as the "Doc Fix" bill, MACRA repealed the Sustainable Growth Rate (SGR) and replaced it with a new payment modality. First, the good news: from 2015 to 2019, there are automatic .5 percent Medicare payment increases for all doctors. Starting in 2019, Medicare reimbursement will be affected by the MIPS score, which is a number from 0 to 100 calculated by the CMS based on data from four categories. Let's start by examining the performance categories. The first is quality measures, and the good news is that existing quality measures your practice already tracks and reports for the Physicians Quality Reporting System (PQRS), EHR Meaningful Use, and others will be used. The second category is resource use and, again, this is described as measures already used in the Value Based Management (VBM) program. The third is Meaningful Use, which is another metric you currently track for your EHR systems. The final category is clinical practice improvement, whereby professionals will be assessed on their efforts to engage in clinical practice improvement activities. File this under "things most practitioners already are doing." Does this all sound familiar? That's because MIPS is consolidating and replacing the three quality incentive payment programs (PQRS, VBM, and EHR MU), which will "sunset" at the end of 2018. CMS has some work ahead to further issue rules to define these categories before 2019 hits, so while we have a good indication, the dust has not settled on definitions. How could your MIPS score affect reimbursement? It's hard to issue specific predictions given the methodologies employed. First, there is a scaling factor of up to 3 percent to make sure that positive and negative payment adjustments result in a neutral or reducing impact on the Medicare budget for each year. Second, just like in school, there is a grading curve of sorts employed to create a performance threshold, which is the MIPS score that marks the line between positive and negative adjustments. This will be determined annually by the CMS based on the average or median of the MIPS scores in a prior period. For the first two years (2019 and 2020), since no previous scores exist in the MIPS system, the CMS will likely use a combination of measures from the PQRS, MU, and VBM systems. In addition to these scores and adjustments, CMS will issue a bonus payment adjustment of up to 10 percent for providers who exceed the 25th percentile of MIPS scores – and the pot will be $500 million each year from 2019 to 2024. Also, if your MIPS score is low but you have improved, you may get an additional reward. And there is help on the way: $20 million will be available each year from 2016 to 2020 for technical assistance available to help practices with 15 or fewer professionals improve MIPS performance or transition to alternative payment models (APMs). If MIPS is leaving you dazed and confused, there is another option available. You can take an off ramp from this reimbursement methodology by participating in an APM. These are defined as programs created by the Center for Medicare & Medicaid Innovation (CMMI), such as the Advance Payment (ACO) Model, the Medicare Shared Savings Program (MSSP) for ACOs, and the Health Care Quality Demonstration Program. These are all programs that require providers to use certified EHR technology, issue payment based on quality measures similar to those used in MIPS, and place risk for monetary losses on providers. Providers will receive some credit for participating in APMs not tied to Medicare reimbursement to reach these minimum percentages. You could also fall into the category called a "partial qualifying APM participant," whereby you are participating in APMs tied to Medicare reimbursement but don't meet the minimum percentage necessary to receive the lump sum bonus. You may not receive the bonus, but you are exempt from MIPS. Have you picked up on the word that these programs share in common? Medicare. Most of the organized efforts to shift reimbursement toward quality and value are originating with the CMS and public plans. If you are like many medical practices, almost 50 percent or more of your revenue is coming from commercial payors. These contracts, for the most part, have not incorporated any of these value and quality metrics. 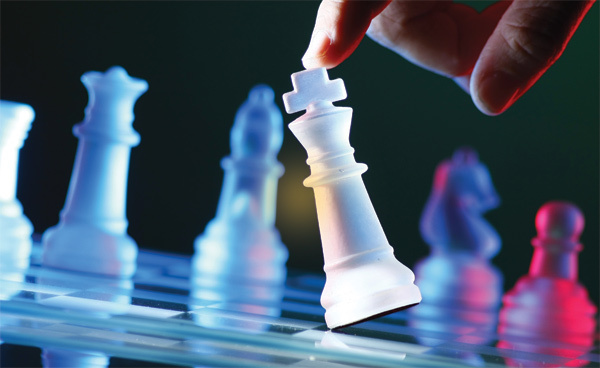 You can't negotiate with CMS, but you can with commercial payors. We recommend shifting your time and efforts from what you can't control (and are already tracking for MIPS) to something you can – especially since it accounts for most of your practice revenue. That is your fee-for-service fee schedules and value-based reimbursements with commercial payors. The need to negotiate with commercial payors becomes even more urgent given the explosion of merger news: "Anthem buys Cigna for $54.2B," "Aetna buys Humana for $37B," "United Health has approached Aetna about a takeover," "Centene announces a $6.8B deal to buy Health Net." These consolidations are driven by payor business efficiency – the need to do more with less now that millions of additional Americans are covered through the ACA. The tendency is to take a wait-and-see approach when it comes to practices' commercial contracts. But doing nothing is the worst thing you can do. It is reasonable to assume that if or when a major merger occurs, the payor will seek business process simplification and streamlining. They will likely do their own comparison of agreements and, where possible, terminate the higher provider reimbursement agreements and offer to merge the contracts into the lower reimbursement agreement. Medical practices need to be proactive and take steps to lock in long-term, multiple-year agreements to create a steady and predictable revenue stream that can weather the storm of changes from public plans and mergers of commercial payors. 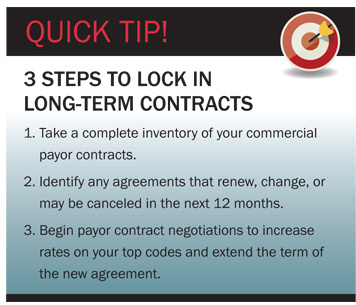 First, take a complete inventory of your commercial payor contracts. You should identify the terms and termination without cause clauses and notification periods and whether or not those notification periods are anchored to be effective on anniversary dates. Read over the payor's notification requirements with regard to material changes to the contract. Then, benchmark the reimbursements in your agreements by comparing your top revenue-producing codes across your agreements to local Medicare rates and the provider reimbursement rates from your other top insurance payors. Second, identify any agreements that renew, change, or may be cancelled in the next 12 months. These are the contracts you want to prioritize during negotiations. Third, commence payor contract negotiations to both increase rates on your top codes and – most importantly – extend the term of the new agreement to be a minimum of three years with built-in cost-of-living increases and, if possible, additional performance bonuses. On the commercial payor side, performance metrics tend to be generally focused metrics related to generic drug prescription rates, EHR, and ensuring that providers refer patients to other network providers for services not provided by the practice in-office. In this rapidly changing reimbursement landscape, you can take positive steps to increase revenue and create predictability in your payor reimbursement fee schedules by keeping a close eye on pending mergers and taking proactive steps to renegotiate well in advance of a merger's conclusion. If you are approached to participate in a bundled payment pilot or to be part of a local ACO, be sure you understand the reimbursement mechanism for day-to-day provision of care. For example, are ACO providers paid on a point system whereby they receive a point for each visit and then each point is tied to a dollar value? Or are they reimbursed on a PMPM capitated basis? What about a fee-for-service basis, and at what rate? Also be sure you understand the formula that the ACO uses for distributing shared savings. Depending on your specialty and the level of risk/reward managed by the ACO, a provider can do well in the ACO environment if they know going in what is being measured, how performance is measured against the benchmarks, and how providers are reimbursed when benchmarks are met or penalized if performance falls short of targets. In most cases, penalization is limited to not getting a shared savings distribution. Also, keep in mind that primary care providers typically may participate in one ACO, while specialists may participate in many. However, keeping track of data when out-of-network specialists participate in patient care is another challenge. We often liken payor negotiations to chess. In chess, one thing is always true: it is bad to be passive. Good players put pressure on their opponents, employing the philosophy that the best defense is a good offense. Passivity in the current payor landscape will make it difficult once the dust settles to exert any leverage on payors who are acquiring network depth and expanding their scope of services. Determine your leverage points (unique services, referral relationships, geographic coverage/patient accessibility to your services, etc.) and use them to your advantage now, so you are well-positioned if and when the board tips. Most of what your practice needs to prepare for the coming changes has little to do with value-based reimbursement and more to do with increasing your reimbursement across a variety of plans and programs through payors. Your value to a commercial payor network is the services you perform, the care you provide, and operational efficiencies you likely already have in place. You can expand your opportunity for increased revenue by leveraging those services and operational efficiencies to contribute to the achievement of the broader goal of improved population health, and you can improve your bottom line by leveraging those same things for increased reimbursement in your current fee-for-service agreements. Steve Selbst is the CEO of Healthcents. He leads the business operations, including contracting and reimbursement analysis. He is the inventor of RevolutionSoftware and leads the development and delivery of the "Blue Print for Success" payor contracting class. Susan Charkin, MPH, is the founder and president of Healthcents and leads client strategy and new business development. Charkin's background includes more than 15 years of experience in senior contracting positions. For more information and for help with your payor contracts, contact Steve Selbst at 831-455-2174 or selbst@healthcents.com or Susan Charkin at 831-596-4992 or charkin@healthcents.com, or visit www.healthcents.com.